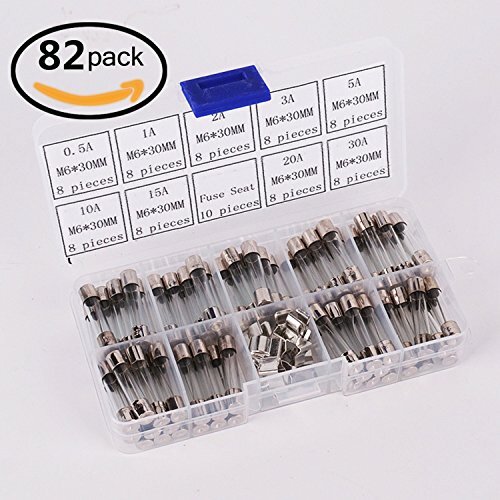 The item is a set of 72pcs simple and practical 6x30mm fast-blow glass tube fuses in 8pcs different fuse Ampere values, and each amp includes 10pcs glass fuses. They are packaged in a clear plastic box for well keeping the different Ampere values separated and easy to access. - 72 pieces of the quick blow glass tube fuses in one set will be sold together. - Material: durable glass and hard plastic. - 100% brand new and high quality 6x30mm Fast-blow Glass Fuses Quick Blow Car Glass Tube Fuses Assorted Kit. - Those glass tube fuses are packaged in a clear plastic box for keeping different Ampere values separated and easy to access.